Cute for kids, a bit twisted and funny for adults! A Guppy?? But I wanted a Puppy! 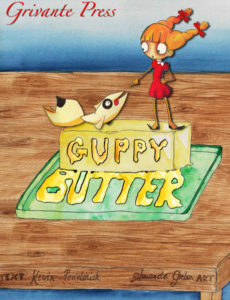 Guppy Butter is the darkly humorous tale of a young girl’s wish for a puppy, but who ends up getting a Guppy instead. She tries her best to meet her father’s demands that if she can keep a fish alive, she’ll be allowed to get a puppy. Tragedy after humorous tragedy ensues as she endures the taunts of her older brother and does her best to keep her fishies alive! Complimented by the amazing art of artist Amanda Gielen, this illustrated tale will leave you laughing!